I've been eager to try Panache's new Envy bra. Being based on their extremely successful Jasmine bra, I figured it would be a good one. However, I heard initial reports that it was different from the Jasmine, so I was worried it wouldn't deliver. However, this weekend I got the chance to try the Envy in a store and I was blown away by how great it is. I haven't tried the Jasmine (shameful, I know) so I can't report back on the differences, but I can say that this is a great bra that I'd highly recommend. Here's the front view. Like the Jasmine and its ancestor, the Andorra, the Envy has a modified full-cup construction with a side support panel and stretchy upper section. This is one of the best shapes I've ever seen--held close to the chest and extremely rounded. At first I couldn't believe the shape I was seeing, so I did some bouncing around, but it seems like this is the real deal. 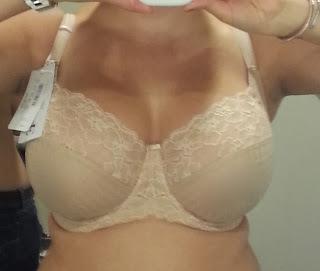 I tried the Envy in a 30HH and 32H. The cups run true to the size I currently need in Panache, Freya, Curvy Kate, Bravissimo and Cleo bras (though I can still wear a 30H in Cleo Marcie), so I would say the cups are true to size. The band felt a little firm to me in the 30, as I'm more of a 32 now. I would say the band is also true to size and is made of a lovely high-quality material like the Andorra rather than the typical crappy mesh. I'm really impressed by this new offering by Panache. Because of the stretchy upper cups, it will work well for both full-on-top and full-on-bottom types--it works to combat both cutting in AND gapping. I'm really glad to see Panache beefing up their collections (which have been a bit weak in recent seasons) with such a well-constructed bra. Thank you for this review - I've been on the fence about this, not cuz I don't want to try it, but because I have SO MANY bras. Since it's beige, I can justify it. I can't wait to get this in black. I have a feeling I might like it better than the Jasmine, because it has less projection. I'll have to be on the lookout for this one! You and I have similar shapes, and the shape of this one is lovely! I'll be on the lookout for this one! You and I have similar shapes, and I'm impressed with how this looks from the side. Nice! Is it supposed to have minimal coverage on the sides of the cup? That seems odd for a full cup style. It isn't really a full cup style. Oh ok. I was kind of wondering why a bra considered full cup would still cause spillage at the sides. It is actually a full-cup, though in some places it's marketed as a balconette. Full-cup simply refers to the seam construction, not (perhaps ironically) the actual level of coverage. You can find balconettes and even plunges that go way higher than certain full-cups, for instance. Full-cups TEND to have fabric higher in the cups, but that doesn't always hold true, and doesn't always translate to the sides. I don't think the side coverage on this one is SUPER minimal, but agree it is lower than some. Sigh. I tried this also, and it's still a hideous fit. Panache just does not work for me. Cleo is good, but a 30 with extender works better than a 32. Panache just doesn't give me enough lift, ever. I'm extremely full centrally and on bottom, and no matter the cut, Panache gives me an upside down seven always. I knew you would like this bra! I have the Jasmine and loved it and ordered this as soon as I saw it. After trying the Envy I think it is the best bra I have including the Jasmine. By the way... I would never have tried Panache after a "Tango II" disaster a couple of years ago if it had not been for your excellent blog and explaination of the Panache line. I credit you entirely with helping me to find the Envy. I love the look of this bra, but not so much the color. It does a lot of good for your shape and it is a good looking bra. Hope to see it in black. You'll be happy to know it actually does come in black! Figleaves and Bravissimo are both stocking it, I believe. I love this bra on you. I love the close to the chest & really round look. I even am ok with slightly minimizing. It reminds me of the Fantasie Rebecca. Have you tried that bra? As you said the kind of bras you now need,I'm curious,were you less FOT before and now are more FOT after wearing better bras? Since you said it changed the kind of bras you need now,I was wondering,did you go from less FoT to more FoT with wearing better bras? I seem to be the only one who gets a pointy fit from both this bra and the Jasmine. The Andorra did not fit that way-Disaster. Panache Emily has the same seam structure, and looks exactly like Envy with different embroidery. It's slightly less evil on me in terms of pushing central, but it gives no lift really. But, heavy tissue, FOB and full centrally - so if a bra is awful for going against my shape, I'm betting it will look great on you. Emily doesn't have the stretchy material in the top, though, which makes it a completely different bra. The stretchy material is largely what makes Jasmine/Envy so versatile.